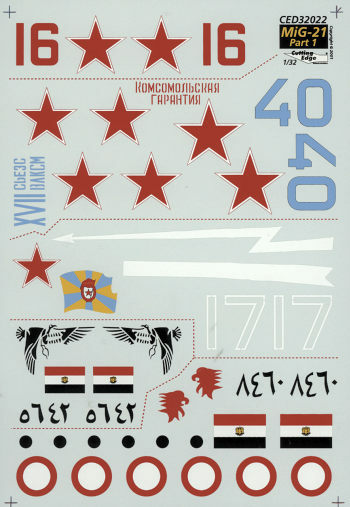 Designed for the Trumpeter 1/32 MiG-21 kits, we have five markings options on this sheet. Three of them are for Soviet planes while the other two are for Egyptian Air Force aircraft. You have sufficient insignia to do one of each. Starting with the Soviets, we have three options. The first one is a MiG-21SM as participated in the Czech invasion of 1968. For this event, there are two red stripes that will need to be painted around the aft fuselage. Next is a MiG-21bis that was flown to Finland for a propaganda visit in 1974. Like the previous option, this plane is in unpainted metal. The third is a camouflaged MiG-21SM from 1985 with a vary colorful flag and lightning bolt on the fuselage side. 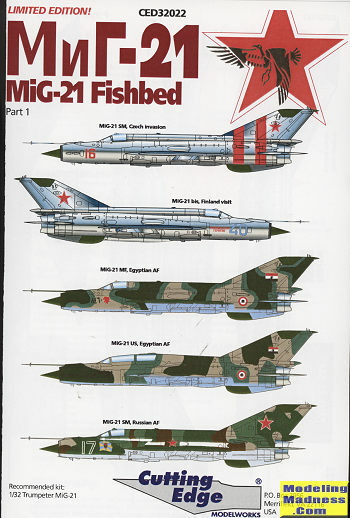 The first of two Egyptian planes is a MiG-21MF from 1981. This plane is in the 'delta' scheme of green, brown and tan. The other, in the same colors but a different pattern, is a MiG-21US trainer from 1981. Apparently Trumpeter has produced all these variants so the only thing you need to do is fine the variant that matches your choice.